Is Mysterious HAARP Project the Cause of Bizarre Square Clouds, Proof of US Weather Control? A video showing strange giant “square cloud” in the sky resulting in claims it proves a top-secret US weather control program is REAL. The video, which has appeared on Facebook, YouTube and conspiracy theory websites, is said to have been filmed in Tuscon, Arizona. The Facebook video of the square cloud phenomenon is at the end of the article. It shows the massive weather phenomenon spanning across much of the sky. As the camera pans around, the cloud seems to have perfect 90-degree corners to give it the appearance of a square. The video sparked wild speculation after being posted to Facebook. The infamous High-Frequency Active Auroral Research Programme (HAARP) was set up by the US government in 1993, and run by the US Air Force and US Navy. Although mostly top-secret, critics accuse HAARP of attempting to weaponise the planet. The US Department of Defence has allegedly attempted to harness and control everything from the weather to earthquakes and use them as weapons. HAARP was based on a US Air Force base in a remote part of Alaska, far from civilian eyes, until military involvement officially ended in 2014. It is now run by the University of Alaska Fairbanks in Gakona, Alaska, which arranges tours of the facility. According to official papers HAARP was set up “analyse the ionosphere and investigate the potential for developing ionospheric enhancement technology for radio communications and surveillance”. However, some conspiracy theorists are convinced the military is still involved and it was really set up to research how to use artificial weather as a weapon against other countries and even how to trigger earthquakes or volcanoes. The controversial programme – run by the USAF, US Navy and research companies – studies an energetic and active region of the upper atmosphere. Many, including Venezuelan leader Huge Chaves, even claim HAARP can be used to trigger huge tremors, including the 2010 Haiti earthquake. “If it is real, and not a cleverly mirrored image, then it is a very strange man-made looking cloud,” another said. Many viewers thought it was a hoax using CGI. One video on YouTube shows how a fake square cloud clip was created from iPhone footage with After Effects CS6 using the 3D Camera Tracker. 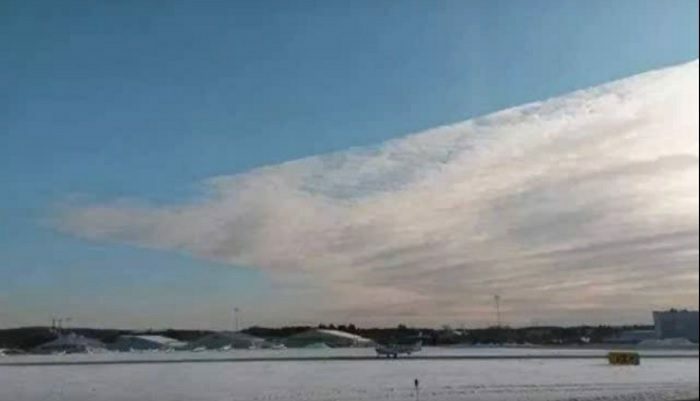 It is not the first footage of a square cloud which has circulated on the internet. In 2015 YouTube channel Sonofmabarker showed a similar video of a square cloud filmed from a jet plane. One viewer said: “Man made cloud plain and simple. *if video seems to large try clicking on the ‘make full screen’ option at the bottom right and view it that way.